New for 2018, the BMW 530e iPerformance offers a combined 248 hp, 310 lb-ft from its hybrid drivetrain and can be specified in both rear and all-wheel drive flavors. The 8-speed transmission is smooth and performance levels are comparable to gasoline powered models. Standard specification includes a sunroof, power front seats and a 10.2-inch infotainment system with integrated navigation. You will have to pay extra for Apple CarPlay but the list of available options is impressive and includes autonomous parking, dynamic damper control and night vision. 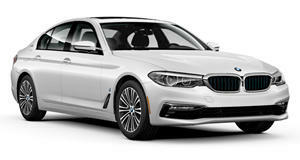 The BMW 5-series has only recently been fully redesigned and offers some of the latest technology in the segment. For 2018 it adds to the existing model range with the introduction of the hybrid 530e iPerformance. With performance levels equaling its gasoline powered counterpart but the potential for much improved fuel efficiency, the 530e may be just what economy-minded shoppers have been looking for. The interior of the 530e follows the rest of the revised 5-series range with a modern minimalist dashboard design, large infotainment screen and top-quality materials throughout. The only hint that there is an electric drivetrain attached to the conventional gasoline motor are some additional cockpit instruments. The seats are firm but offer good support for the front occupants while the rear row will seat three in comfort, although it helps to have the smallest passenger seated in the middle. The trunk is slightly smaller thanks to the placement of the battery pack but it should still be generous enough for most and the rear seatbacks retain their fold-down capability. Weighing around 500 pounds more than the standard 530i, the 530e iPerformance masks its additional girth rather well. It helps that most of the weight is low down as this gives the big sedan a very sure-footed and stable feel around bends. The controls and transmission respond just like they would in a conventionally powered car and the transition between fully electric and gasoline assisted modes is imperceptible. The 5-series is well-damped and offers excellent bump absorption and very little road noise makes its way into the cabin. The 530e features a 2.0-liter turbocharged four-cylinder engine and an electric motor that combine to provide 248 horsepower and 310 lb-ft of torque. A smooth 8-speed automatic transmission works in conjunction with either rear or all-wheel drive. The 0-60 mph time is a commendable 6.0-seconds with the rear-wheel drive setup or 5.8-seconds with all-wheel drive. These figures are identical to the 530i and rather quick for a hybrid vehicle. The 530e is also capable of limited all-electric running and depending on the driver selected driver modes, can be configured to run on a combination of the two powerplants. Fuel economy is a claimed 72MPGe for RWD models and 67 MPGe for the AWD cars. Real-world efficiency will be heavily dependent on how often you take advantage of the electric powerplant. The 530e shares its specification levels with the rest of the 5-series range and while there is one trim level, you can choose from a number of packages to personalize your vehicle. To start things off you get to choose from between a Sport line, Luxury or M Sport Design style packs which adds unique aesthetic options to your BMW and in the case of the M Sport you also get sports suspension and larger alloy wheels. Basic equipment includes LED lighting, 10.2-inch infotainment system with navigation and gesture controls, a 12-speaker audio system and power front seats with memory settings. A power sunroof and leatherette seat coverings are also part of the standard equipment. A Premium and Executive Tier can also be optioned which bundle some available options together. A number of packages are available based on which tier and design style is chosen. The Parking Assistance Package which adds a rearview camera, active park distance control, parking assistant and a surround camera system. The Dynamic Handling Package adds M Sport brakes and dynamic damper control while the Driving Assistance Plus Package offers a range of safety systems such as lane departure warning, frontal collision warning, city collision mitigation and pedestrian protection. Some notable standalone options include wireless charging and WiFi hotspot, head-up display, soft-close doors, power tailgate, two audio system upgrades, night vision and power rear sunshades. The dynamic agility that has defined the BMW 5-series for decades has not been diluted in the move to a hybrid powertrain, the 530e promises identical performance and pricing to the 530i with the added benefit of enhanced fuel efficiency. With very little to differentiate it from the rest of the 5-series range in both design and driving experience, the 530e promises hybrid economy benefits without the usual drawbacks. That is if your driving routine and style can make the most of the electric powertrain.